Charting loss, love and the difficult art of growing up, these stories unfurl with wicked humour and insight. Two young boys make midnight trips to a boat graveyard in search of their dead sister, who set sail in the exoskeleton of a giant crab; a boy whose dreams foretell implacable tragedies is sent to 'Sleepaway Camp for Disordered Dreamers' (Cabin 1, Narcoleptics; Cabin 2, Insomniacs; Cabin 3, Somnambulists...); a Minotaur leads his family on the trail out West, and finally, in the collection's poignant and hilarious title story, fifteen girls raised by wolves are painstakingly re-civilised by nuns. Karen Russell's one of those authors who's been on my TBR for quite a while now. For a long time I'd heard she was a beautiful writer, if a little difficult to follow sometimes, and I was ready to accept the challenge and step out of my comfort zone. Her style has been likened to Angela Carter's, and as someone who, unfortunately, isn't the biggest fan of Carter's work I wasn't 100% sure if Karen Russell would be for me or not. Now that I've read her debut collection I'm still not 100% sure. One thing can't be doubted here: Karen Russell is an excellent writer. This collection was published when she was only 25, and her talent is obvious; some of her sentences are just gorgeous and such a pleasure to read, but I think that might have been part of the reason why I ultimately came away from this collection rather disappointed, because at times it felt like more effort had been put into the way the stories had been written rather than the content of the stories themselves. I admire beautiful writing a heck of a lot, but I love stories more. Some stories I really enjoyed; 'Haunting Olivia', 'from Children's Reminiscences of the Westerward Migration' and 'St. 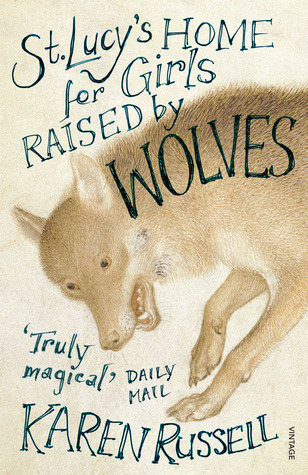 Lucy's Home for Girls Raised by Wolves' were my favourite stories in the collection, but the more I think about this book the more I realise those three were probably the only stories I truly enjoyed. Every other story in this collection I either found really frustrating or I just didn't care about all that much. Yes, her writing style is quirky, but it's just a bit too quirky even for me. What the stories in this collection all suffer from is the lack of an ending. Russell doesn't finish her stories, they just come to an abrupt stop, and as someone who's a big fan of a beginning, a middle and an end - particularly in short stories, because the ending to a short work can completely make or break it for me - I found it so frustrating. 'Haunting Olivia' and 'St. Lucy's Home for Girls Raised by Wolves' had the most concrete endings to me, which is probably part of the reason why I enjoyed them more than the majority of the other stories in the collection, but even 'from Children's Reminiscences of the Westward Migration' was the casualty of a disappointing non-ending. The stories were also far too samey for me. So many of them are written in first-person with a precocious child narrator (how many children use the word 'obdurate'? ), usually a little boy, and none of these little boys are particularly distinctive other than the narrators of 'Haunting Olivia' and 'from Children's Reminiscences of the Westward Migration' - but I have no idea if I remember them because they're written differently or because I at least enjoyed their stories. I understand that short story collections usually have a theme, but there's a big difference between themed stories and the exact same story over and over again. Originally I rated this collection three stars mainly because I figured two stars was a bit harsh for a writer who can write, but how can I rate something three stars when, for the most part, I didn't actually enjoy it that much? This is only Russell's debut, so perhaps I'm being a little harsh; I've seen plenty of people who feel the same way as I do about St. Lucy's Home for Girls Raised by Wolves say that Vampires in the Lemon Grove is a much stronger collection. I'll give it a go at some point, but right now the name 'Karen Russell' is giving me a headache.